It would be far more strategic, efficient and democratic for single-issue protest groups and the unions to vote for a reform to direct democracy now, than it would be to continue with begging, fighting the police, and other indirect action. Since 2010, we've written about how David Cameron intends to militarise UK police forces [to counter shrinking army personnel numbers] in preparation for harsh domestic social policy implementation and since then and despite the efforts of movements such as Occupy [backed by Anonymous] and other civil movements, nothing has changed and Cameron has been able to progress with what is in reality, the agenda of the Rothschild and Rockefeller families. Revolution is the result of oppressed evolution expressing itself and this often involves violence but, true and efficient evolution has no use for violence. Revolutions are won by those who use the most force because in a revolution, there is no election. Evolution involves people actually choosing to advance their systems and so, true and direct democracy can only come through evolution. We advocate using legal mechanisms for strategic reasons only [not for ethical reasons] because while we do not believe in the rule of undemocratic religious-influenced laws, we do believe that to maintain social stability and security, that we need to fight on Parliament's turf. Legitimately spoil your vote - mark 'PA' for reform to true democracy. When Parliament created the Parliament Act of 1297 [a replacement constitution for the Magna Carta of 1215], it failed to copy across Clause 61 [lawful rebellion] and in doing so, it broke existing and current contract laws and to this day, it has never been challenged by a single so-called 'representative' and, the 1215 Magna Carta specifically states that to maintain it as a legally binding agreement, no clause can be amended or repealed without the agreement of the people. Under Clause 61, there was a range of options available to the people [including the right to with-hold tax payments] but through unlawful manipulation of what was the nation's first ever constitution, Parliament has ensured that protest is the only available act of lawful rebellion remaining [the UK people have never demanded for freedom of speech to be written into law] and, it is not a coincidence that the only remaining lawful tool of rebellion is the only one that can't change policies or directly affect Parliamentarians. As well as being demonstrative of Parliament's blatant disrespect for common law, this also demonstrates that under the monarchs and in 1215 and before 'democracy', the people were given more respect than they are given now [and therefore more powers] without even having to ask! It is only majority national protest that has the potential to achieve change in any country and, it is only majority national protest that would be democratic. 1 million people protesting against Tony Blair's personal desire to invade Iraq in 2003 made no difference - despite this war being based upon corrupt evidence and therefore completely illegal and, former 'President' Blair has been acting as an advisor to his chum 'Dave' and so, expect more of the same because after all, they're both Thatcherites. In July 2014, the UK had its largest ever public protest and it failed to change a single policy. 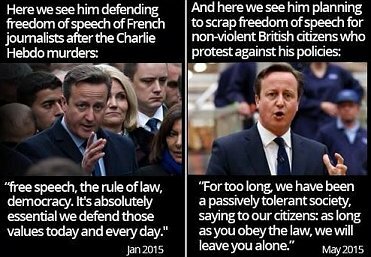 David Cameron himself said that protest "won't change anything" and he's correct because protest don't target or affect him or any MP. The result that these protests did though achieve was to give him the excuse he needed to implement the next round of harsh social policy - which he announced on the day that he would do and, as a direct response to the protests. Further to this, the fact that the UK's largest ever protests were about money and not child welfare, war or the environment [for example] is in our opinion, further testament to current 'Great' British values. The previous 100 years of UK social history demonstrates that not one local or national protest has ever reversed a single government policy, yet the environmental protesters continue their sleep-walk instead of taking lawful direct action and on this basis, we hold them just as responsible as consumers, voters and governments when it comes to aiding environmental destruction. When you consider that the clinical definition of insanity is 'to constantly repeat an action that results in failure', the act of protest is clearly insane and in reality, the only outcome that protests achieve is to enable governments to implement harsh social policy and so, protesters actually give governments exactly what they want [they allow themselves to be played]. In the words of protesters themselves [BBC3's Fighting The System - March 2015], protesting "Makes us feel special." and "Makes me feel like the chosen one." Begging our servants makes them our masters so, why empower them further when we can vote for true and direct democracy in the next general election or when can use existing laws to take immediate, legitimate and peaceful control of all policy-making decisions now? Begging our servants conforms to the illusion that the people have no power and, as long as the people perceive that they have no power, Parliament takes advantage because all politicians know that it is us who use our power to give them control and responsibility over our lives. No politician has ever taken anything from anyone - we give them the power in every general election by choosing to vote to maintain a theocracy instead of voting for self-rule and direct democracy. Why bother fighting with the police [who are not the enemy] when we can use existing laws to take legitimate control of all policy-making decisions? Why choose to be played? It is no coincidence that the police no longer visit schools and that all police TV programming [documentaries and fictional] now focus only on police response work and never on police community work - ensuring that we only see them at their worst. It is no coincidence that budgets for police community work have been reduced to nothing [for the first time ever] since David Cameron took office - despite protests from the police. Parliament has learned through previous experience to foresee the effects of harsh social policy implementation and, this is how and why David Cameron would have been prepared for emerging groups [such as Occupy etc], as well as the Unionist protests. Parliament is also very aware that protestors choose to fight the police [as opposed to fighting them] when things get out of hand and so with this in mind, how is any protest group not actually doing what David Cameron wants them to do? It is a theocratic parliament disguised as a representative democracy that is the only enemy and, a legitimate and peaceful majority-supported reform to direct democracy would be the most efficient weapon. The People's Administration's constitution for reform to direct democracy and our voting protocols have both been sanctioned by the UK Electoral Commission and the UN. In a general election, the People's Administration does NOT have to field candidates to secure your vote on the ballot paper. Outside a general election, you can vote for a legitimate reform to direct democracy now! The People's Administration does not advocate the use of violence [other than in self defence] or non-legal methods of any kind, as the People's Administration believes in promoting evolution over revolution. The benefit to the party administering the violence is that this party is able to modify the behaviour of another against their will, to suit themselves. The cost to the party administering the violence is that the behaviour of the other is only altered whilst the violence is being administered. In some form and at some point in time, the modified behaviour will revert because the use of violence does not change peoples minds, hearts and attitudes and instead, it only changes their behaviour in the short-term and this is due purely to the survivalist nature of all humans. As an additional cost, the administrator of the violence may come to experience forms of resistance and then even revenge. Some label this resistance as 'terrorism' and some label it as 'freedom fighting' - both opinions, not facts. It is the nature of human beings to make our own choices [to be free]. Therefore, self-rule is in our nature. Physicians, politicians and military planners now accept that in any circumstances, the power of resistance always eventually equals the power of oppression so eventually, our 'so-called democracies' will evolve from partisan-based to people-based and direct democracy will be the new culture of politics. With this being our philosophy regarding the use of violence [other than in self defence], the People's Administration sees no sustainable benefits arising from its use and while some believe that violence in used in self defence is not violence, we do not share this view. 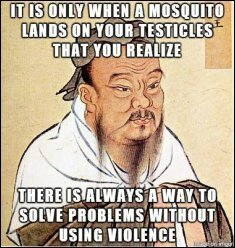 We accept that violence would be the tool that we would be using even if in self defence, and we're okay with this. Any protests co-ordinated by the People's Administration will happen ONLY in the event that a majority vote for a reform to direct democracy is not accepted by the UK Parliament and is resisted. In this situation, the People's Administration will conduct, encourage and support ONLY peaceful and non-violent national protest. For direct democracy to become a sustainable reality, even its conception has to be by the honest will of the majority and in peace or it simply will not last. A system that is all-inclusive can only truly be all-inclusive if its implementation is itself, all-inclusive. Anything else would not be direct democracy. Only a Western reform to direct democracy now, will save the economy, the environment, and the world and it is only mainstream media agencies that are preventing you from knowing that you can make it happen legitimately, immediately, with majority election and without revolution.